Attract Bluebirds with a best in class Bluebird feeder. 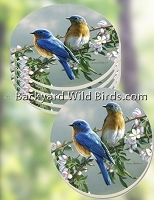 Bluebird Mealworm Feeders serve Bluebirds their favorite mealworms food. Bluebird Feeders can be protected, covered trays or nice dishes to offer mealworms. 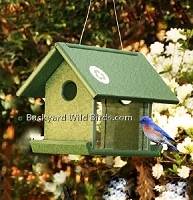 Bluebird Protected Feeder offers Bluebirds their mealworms in peace and gives great views! Bluebird Mealworm Feeder multipurpose tray with adjustable clear 11" Dome above, great bird feeder for serving Bluebirds mealworms. Also good for fruit, nuts, berries, and special seeds. Bluebird Mealworm Hanging Feeder has a blue dish and metal hanger arm. 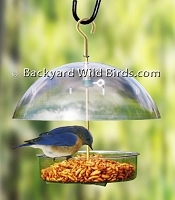 The polycarbonate plastic dish bird feeder is used to feed mealworms, grape jelly, fruit, seed, nuts or suet nuggets. Bluebird Mealworms are a preferred choice when feeding dried mealworms to bluebirds. These choice Mealworms are used in a Bluebird Mealworm Feeder tray or bowl. The dried mealworms are in a convient 10 oz. tub. This protected cedar wood feeder is designed for use by Bluebirds and small songbirds. Owl Decor Bird Feeder is a decorative metal bird feeder with a lot of charm. The Owl feeder has about a 9.5" diameter and its bowl is accessible to all wild birds. The decorative feeder gives birds lots of area to feed at the same time. Recycled Mealworm Feeder allows you to " Go Green" and enjoy your Bluebirds in their very own green recycled mealworm feeder.